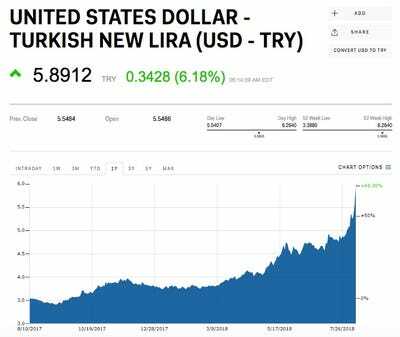 The lira “is falling so fast that a parachute is the first thing that comes to mind to prevent the lira smashing into the ground,” Bart Hordijk, a market analyst at Monex Europe, told Business Insider. The Turkish lira hit an all-time low against the dollar on Friday, and there are growing concerns that the country’s economic troubles could spread to the eurozone. The recent plunge comes after a Turkish delegation in Washington failed to stop the US from imposing sanctions against two senior ministers. The lack of central-bank action to support the currency is also spooking investors and Erdogan’s previous comment that interest rates are the “mother and father of all evil” hasn’t helped. The lira “is falling so fast that a parachute is the first thing that comes to mind to prevent the lira smashing into the ground,” Bart Hordijk, a market analyst at Monex Europe, said in an email. Markets InsiderThe dollar’s rally against the lira. Concerns are mounting that the decline will start to hit European banks. The eurozone’s chief financial watchdog has become increasingly concerned about the exposure of some of Europe’s biggest lenders to the country. They include BBVA, UniCredit, and BNP Paribas, and the exposure to those lenders is being closely watched, the Financial Times reported.